If you find you are becoming more and more interested in the debate around genetically modified (GM) foods, you might want to consider actually taking action and becoming involved. There are a number of ways to participate in the debate although the best way to start is by communicating with organisations that play a key role in the debate on GM foods. There are many ways in which you can support an organisation that plays a role in GM foods. If you are against GM foods, there are organisations that work on the side of the farmers and growers of crops, reviewing new developments in the field and looking at their effects on farmers and the overall industry. Other organisations are less specific and instead, focus on the production and regulation of GM foods as well as public opinions and attitudes towards the technology in terms of supermarkets and personal choice. You can also choose to write letters to the relevant government and regulatory authorities although there is no guarantee of any response. Some people find that letter writing is frustrating while others feel good about sending the letter, even when it isn't formally acknowledged. If you are against GM foods, you can quite simply choose not to consume them, although this requires some effort by reading labels and you may end up purchasing more expensive, organic produce. At a very basic level, however, avoiding the purchase of GM products is a direct action you can take if you are against GM foods. There are many online groups that focus on topics of discussion such as GM foods. Here, you can share your views, learn more information about GM foods and also perhaps make some new friends along the way. Many message forums and reader groups share tips on how to live your life in ways that are true to your opinion on GM foods. Other groups will be the first point of contact for learning about rallies and protests that make the public voice a loud one on the topic of GM foods. Always approach protests with care, however, because taking action and making your voice one that is heard will never be successful if you partake in aggression or violence. 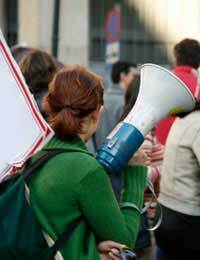 Peaceful protests can draw positive attention to the issue of GM foods while aggression only wrecks havoc on the reputation of those against GM foods. Before you even begin to think about taking action in the debate on GM foods, you should be sure that you have read and learned enough information to make an informed decision about the technology. It's also important to keep in mind that research is rapidly changing in the field of GM foods, so you may find that what you learn tomorrow puts a different spin on your opinions today. When you are ready to make your voice heard, you can join an organisation that shares your beliefs. This will allow you to network and keep in touch while also alerting you to the newest developments in the area of GM foods. You do have a voice but you will need to take action if you want it to be heard.